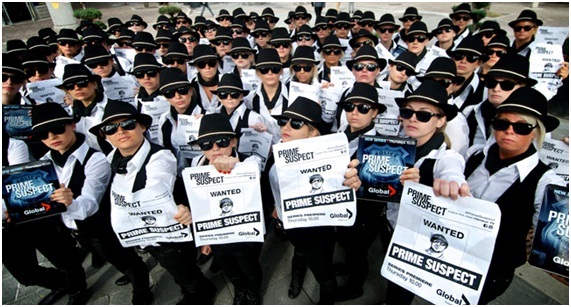 “Flash Mob”- Prospects As An Exploitable Promotion Strategy | Business Article | MBA Skool-Study.Learn.Share. In today’s highly competitive market, companies are desperately in search of new marketing strategies in order to sell their products to the customer. The existing promotional strategies have started to lose its effectiveness in capturing customers’ attention. In this article, I have made an attempt to explain the concept of Guerrilla Marketing (which is relatively new in India). 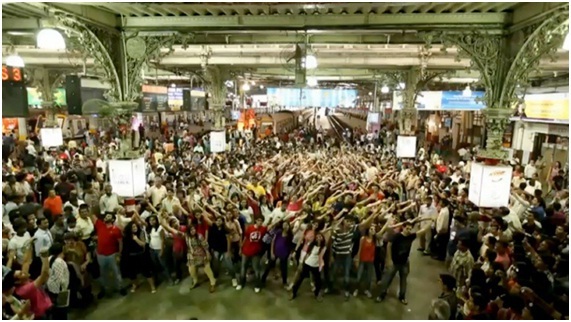 The phenomenon “Flash Mob” is a form of Guerrilla Marketing, and a rising trend witnessed in India- especially in Metros. It is currently used as a vehicle for spreading social messages. Its acceptability in this conventional country still remains a question mark. Flash Mobs in India can turn out to be either a Fashion or a Fad. Considering the fact that it has created a rave in India, its prospects as an exploitable marketing channel to reach customers seem highly favourable. Adoption of this strategy might boost companies’ yields and in turn raise their market share. The concern remains as to whether it would be as successful a promotional strategy as a social vehicle. All that it needs is to think out of the box and have loads of creativity. It is not preachy or educational but actually makes the viewer surprised, entertained and even part of the campaign. The more creative the campaign is the more attention it captures. 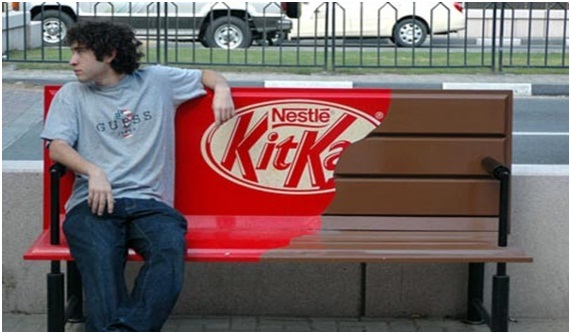 Picture 1:- This is one of the simplest examples of Guerrilla Marketing and may be the cheapest. All it would have taken for Nestle is a can of paints, and of course permission from the city corporation, to market this product. It is not necessary that Guerrilla Marketing to be used only for commercial purposes. Picture 2:- When garbage dumping became a problem, the Auckland City Council replaced the regular black rubbish bag into a bushy hedge, sending a message in itself. Many companies, small and large have used this marketing strategy and have achieved a great response in the form of increased sales and market share in many countries. It is still used widely but not as frequently, relative to other forms of advertising or promotional strategies. Guerrilla Marketing takes different forms such as Graffiti, Sticker bombs, Flash Mobs and anything or everything creative. Suppose you are in a mall and suddenly regular shoppers (or so) come together and do something out of the blue, don’t be shocked. You are witnessing a flash mob. They might dance, sing, do a tableau or simply do something together in perfect sync and disperse into different directions once the act is complete. This is done either as an advertisement campaign, as a social awareness act, as a protest or for entertainment. Picture 3:- Hundred actresses got dressed as Maria Bello's Jane Timoney character in the rookie NBC drama in Canada to market this U.S. network series. The first flash mob took place in 2003 in New York Macy’s, where hundreds of people entered a store searching for a “love rug”. The first flash mob in India took place in Mumbai’s Chhatrapati Shivaji Terminus, a day after the third anniversary of 26/11. Shonan Kothari organised this flash mob as a tribute to the victims of the terror attack. She was successful in getting permissions from the Mumbai police as well as the railway authorities and most importantly, bringing in two hundred youngsters to practise and dance together for ten minutes. The commuters were taken by surprise and this was what the mob wanted out of their performance. 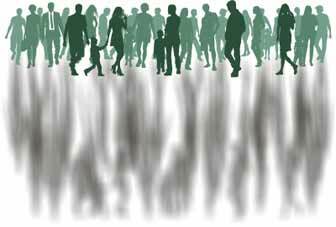 Even though India has gone through a lot of development, majority of the public are very conventional and traditional. They are new to this concept and might take some time to accept it whole-heartedly. Still, this phenomenon has been taken up and performed in various parts of India such as, Noida, Vishakhapatnam, Vadodara, Kochi and Hyderabad. It is safe to say that Flash Mobs are rapidly gaining popularity and acceptance. “It’s the new rage. It’s fun, it’s entertainment and it’s an effective vehicle for social messages.” This is how Neha Malude described Flash Mobs in The Hindu’s Sunday Supplement “Magazine”, published on June 17, 2012. India has a highly competitive market where there are many enterprises selling the same or similar products. Consumers are rational and have full access to information about products (with the advancement of technology and Internet). So, it has become an absolute necessity for enterprises to satisfy consumers for their survival. In such a scenario, the only way in which a firm can have a fair market share is by creating product preference or loyalty. This can be done by increasing the product utility and backing it up with heavy advertising and promotional strategies. Almost all promotional strategies have become common and are slowly losing its effectiveness in catching the attention of the public. As mentioned earlier, advertisements only educate the consumers and fait to engage or entertain them. This is where companies can utilise the concept of Flash Mobs, which has already started gaining popularity among the crowds. Flash Mobs have been successful as a social vehicle for spreading social messages; in other words, they have been able to draw attention. So this could be the new promotional strategy which can be exploited by different firms. Flash Mobs seek fun and get it too. So participation can be ensured; but the main task is to manage or coordinate them. This of course, is not a Herculean task keeping in view that there are people like Shonan who have been able to gather, manage and co-ordinate a two hundred member flash mob and turn it into a huge success. On the flip side, Flash Mobs are performed in metros and malls. This is comparatively a very small portion of the target market. If a company takes up flash mob as its marketing strategy, it may not get the coverage that a mass communication media such as a Television or Radio would. There might be a little amount of work to do such as getting permissions or paying rent for the space used and even the mob (if the concept gets wide acceptability then the mall authorities might also try to exploit the same). Most important of all; is its acceptability itself. It is too early to say if “Flash Mobs” are a fashion or a fad. The difference is that, fashion may stay for a long time but fad ends as soon as the novelty of such a phenomenon fades. Flash Mobs are new in India and have become the talk of the town. It has definitely created popularity. The concern is whether it would gain acceptability in this traditional society. If it does, it could be the next promotional strategy exploited by companies to market their products. Being the most cost–effective (in comparison to other marketing strategies), at the same time crowd-engaging phenomenon, its ability in promoting a product is almost undisputable. It has created positive results as a social vehicle in India, it still needs to be seen whether it would do the same as a promotional strategy. This article has been authored by Ambili Jayachandran (M.Com) from Department Of Commerce, University Of Kerala.